Olympic athletes train many years for performances that last few minutes. Also architecture demands long training, yet its outcome lasts for decades, or centuries – at least, that is the expectation. Yet “…the times are a-changin’,” as Bob Dylan put it. On one side, large portions of the buildings that spectators will see during the Games will not be there a few months later; on the other, much of the Olympics-related development, which will last for a long time, may go unnoticed. That’s good news. London’s venture is an urban effort of a scale and ambition that Great Brittan has not managed for a long time. The approximately $14 (£9.3) billion total cost, when compared to the $44-plus billion cost of the Beijing’s Olympics is, for the most part, money well spent. London won the bid in 2005. Basic programmatic objectives were established long before architects started to scheme out ideas on napkins. Richard Rogers (co-architect with Renzo Piano on Paris’ Pompidou Center) was the chair of UK’s government Urban Task Force. It was an opportunity to redevelop east London as a green and sustainable urban matrix for the future. A 500-acre park would be part of it; housing for thousands was envisioned; new and improved infrastructure would make the Olympic Park reachable in ten minutes; railway and subway stations, bridges and public plazas would be rehabilitated or built anew. 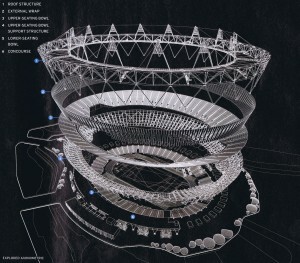 In other words, an Olympian architecture. I was in London in 2006 with my wife on a business trip. 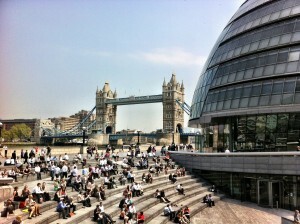 For our “time-out” we chose to visit Norman Foster’s egg-shaped City Hall by the Thames. We dressed up as regulars from “The City” (London’s Wall Street,) complete with raincoats and umbrellas and we crossed the entrance doors of the building and walked straight to the airport-like security-checking gate. We purposely left our cameras at the hotel. As soon as we were cleared, we started to climb the helical ramp that ascends to the top of the building. Along the way we encountered the Assembly Hall’s doors. We walked in. The London Assembly was in session, with all it 25 members present. We sat at the almost-empty area designated for the public. The agenda’s subject was “Parking and Security for the Olympics.” After three hours of presentations and debates, the Assembly voted for “zero-parking,” except for 70 stalls to be used for ambulances and VIP’s. Investment should be directed towards public transportation, to facilitate access to the Olympic Park from anywhere. What a lesson on political foresight! 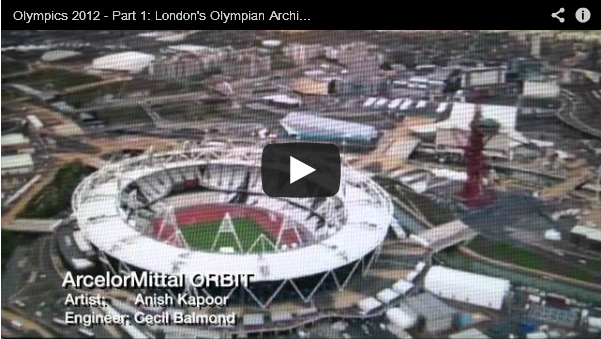 The central idea for the Olympic Park was to create a 16-mile green spine, to focus on designing low carbon-footprint buildings, and to leave a functional legacy to the surrounding communities. An Energy Center, one of the largest facilities in the UK, was created to combine cooling, heating and power to reduce carbon emissions by 50%. A second Energy Center was built in Stratford City. Both centers were thought to serve East London after the Games and constitute the beginning of a network of energy centers that would supply 25% of London’s power needs by 2025. The park was designed by American landscape architect George Hargreaves and local LDA Design. It started with Hargreaves paying good attention to what was already there: a wetland crisscrossed with bits of the river Lea, with channels, and having multiple changes of level and fragments of its industrial past. After the Games the hard surfaces will shrink and the green will increase. 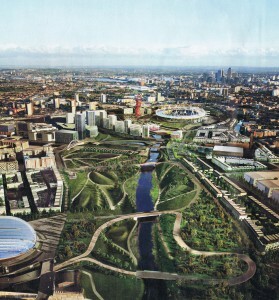 More than 11,000 new homes will be built on portions of the Olympic Park. When it re-opens in 2013, 40% of the properties will be family homes with three or four bedrooms, and 35% will be reserved for affordable housing. The Aquatic Center, designed by Iraqi-born British architect Zaha Hadid, is along similar self-restrained lines. Hadid, a Pritzker Prize laureate (architecture’s “Nobel Prize,”) is usually a designer of expressive and voluptuous architecture. This time she combined her talents with Ove Arup & Partners engineering know-how and blended the practical with the poetical in a steel-framed and timber-clad undulating roof that evokes fluidity. Planned to accommodate 17,500 spectators during the games, it will be reduced to a modest 2,600-seat facility, more in scale with regular use. While the whale-looking roofed portion of the building will be permanent, the “wings” enclosing 80% of the spectators during the Olympics will be clipped. In the gaps between the bowl and the roof, huge glass walls will be installed after the games, opening the space to the sky and the surrounding park. 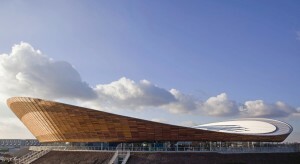 The 6,000-seat wood-clad wavy-roofed Velodrome, designed by London’s Hopkins Architects, was conceived to be lightweight and efficient, to reflect the design of a high-performance bike. Its sustainable-design features include natural ventilation and ample day-lighting. The lightweight cable-net roof system encloses the facility entirely and spans a length of up to 130 meters (427 feet). It is a structure beautifully attuned to its purpose, spare in construction, which sits elegantly on a little hill. 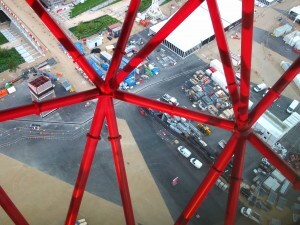 The Olympics Park also includes a poetic component: the ArcelorMittal Orbit. It is a 115-metre-high (377 ft.) sculpture, the largest piece of British public art, wild and unexpected. Sited between the Olympic Stadium and the Aquatics Centre, it allows visitors to view the whole Olympic Park from two observation platforms. 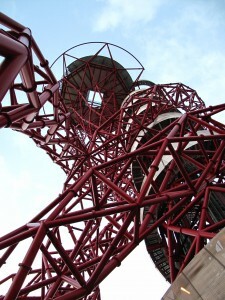 Orbit was designed by a fantastic duo: Anish Kapoor and Cecil Balmond. Anish Kapoor is an Indian-born British sculptor, best known in America as the artist of Millennium Park’s Cloud Gate, in Chicago. Engineer Cecil Balmond, the brain behind Ove Arup and Partners, is a Sri Lankan-British designer, artist, architect and writer. His approach to structure is derived by theories of complexity, non-linear organization and emergence. 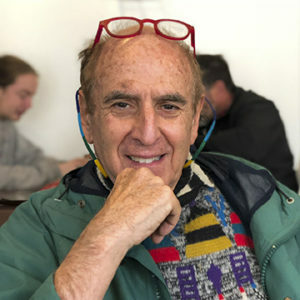 He founded an experimental research and design unit bringing together architects, mathematicians, programmers, artists, musicians and scientists.